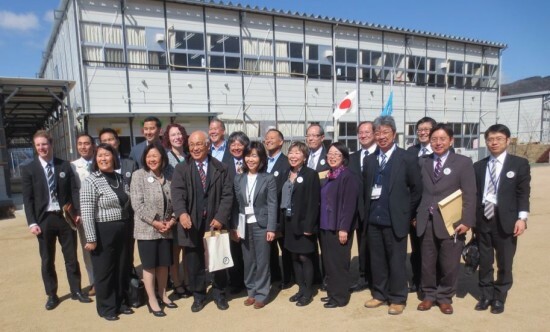 The 2013 Japanese American Leadership Delegation visits a school in Fukushima. USJC President Irene Hirano is in the front row, second from left. Irene Hirano, president of the U.S.-Japan Council, issued the following statement on Monday, the second anniversary of the Great East Japan Earthquake. “Two years ago today, Japan suffered enormous tragedy. On the second anniversary of the Great East Japan Earthquake and tsunami, we remember the loss, but also recognize the progress made towards recovery and the strength and determination of the people of the Tohoku region. “I am currently in Japan with the 2013 Japanese American Leadership Delegation. This program brings Japanese Americans to Japan to build people-to-people connections with Japanese leaders from all sectors of society. For the first time in program history, the delegation visited Fukushima, where we learned about the state of the recovery efforts and sought to demonstrate that Fukushima is a safe and enjoyable place to visit. It was especially meaningful to be there on the anniversary of the disasters. From seniors to school children, we were inspired by the resilience and spirit of the people there. “We visited a temporarily-constructed elementary school that brings together three schools in one facility, spent time at Fukushima Medical University and toured an agricultural inspection center. At the exact moment of the earthquake, 2:46 p.m., we were at Odagaisama Center, a community support center for evacuees living in temporary housing. We observed a collective moment of silence. “Every visit in Fukushima reflected the sentiment that people want to share their experiences with the world so that others can benefit from the lessons learned. As Japanese Americans, we understand the importance of sharing one’s story in order to find common ground as the first step to building people-to-people and country-to-country connections. “Many alumni of the Japanese American Leadership Delegation program have shown a commitment to supporting Japan, reflecting the strong bonds built while on the trip. Past participants, along with U.S.-Japan Council members and board members, have made numerous trips to the Tohoku region since the disasters. “The U.S.-Japan Council continues to support recovery and revitalization through TOMODACHI, our major initiative launched with the U.S. Embassy in Tokyo with the support of the government of Japan, corporations, organizations and individuals from the United States and Japan. In 2012, close to a thousand young people participated in TOMODACHI programs, contributing to our mission of investing in the next generation of Japanese and Americans. We are fortunate that several of our successful programs from 2012 will be repeated in 2013 and beyond. We are seeing great strides being made in creating a true ‘TOMODACHI Generation’ of young people who care about each other’s countries and cultures. “We have also been committed to supporting the growing non-profit sector in Japan. Many of the organizations we funded through our initial USJC Earthquake Relief Fund have stayed engaged with the council by attending our events and networking with their American counterparts. By providing platforms for the exchange of information and by building a strong network of non-profit professionals from both countries, we hope to continue bolstering support for civil society in Japan.